Smash the window out of th—a big government in this country! He almost said “the big government” but switched to “a big government,” and so it’s fair to ask, “A big government what? Building? 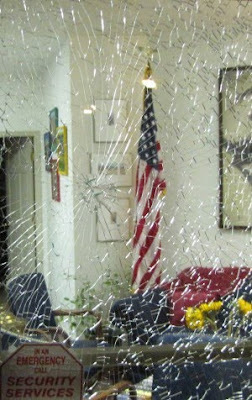 Office?” He didn’t say “Smash the window on big government in this country”—which would have made the statement more plausibly a metaphor—but “Smash the window out of th—a big government in this country!” And so without the word “building”—as in “Smash the window out of a big government [building] in this country!”—the sentence makes, well, no sense. He got his wish, didn’t he? This entry was posted in Uncategorized and tagged America, authoritarianism, Ayn Rand, brick throwers, conservatism, fundamentalism, health care reform, right wing, terrorism, tim pawlenty. Bookmark the permalink. 2 Responses to Conservative Brick Throwers and Tim Pawlenty: Did Tim Pawlenty Call on Republicans to Smash Federal Government Building Windows? C’mon, Santi. That’s hardly the rhetoric of someone inciting violence or vandalism or whatever. Sure, he stumbled over the words a little, but he was clearly going for metaphor. Maybe I’m reaching, but when is a metaphor not a metaphor? And I still pay some respect to Freudian psychology and “Freudian slips.” I think that violence is in the psychological air of the conservative movement and it is spilling from the subconscious of conservatives in the form of hostile metaphor. It is a curious coincidence, but I’m also more than willing to entertain the possibility that the two phenomena are not causally linked but only accidentally correlated (post hoc, ergo propter hoc).